Sarah Nader- snader@shawmedia.com Kevin Ellison and Lonni Oldham both of Huntley, look at the 1950's- 60's holiday display at the McHenry County Historical Society and Museum in Union December 27, 2013. 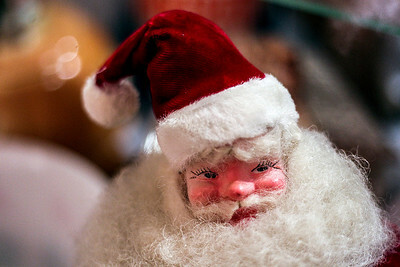 Society board member Dave Harms of Crystal Lake, with the help of antique dealer Lynne Eltrevoog of Marengo, compiled the must-see display featuring a selection of rare, vintage radios – including one honoring Mickey Mantle and Roger Maris, plus a working 1951 Rudolph the Red Nosed Reindeer model. The display is meant to re-create the feel of a 1950s streetscape. Sarah Nader- snader@shawmedia.com A vintage santa is on display at the 1950's- 60's holiday display at the McHenry County Historical Society and Museum in Union December 27, 2013. Sarah Nader- snader@shawmedia.com Dawn Ellison (left) Alice Gordi, Kevin Ellison and Lonni Oldham all of Huntley, look at the 1950's- 60's holiday display at the McHenry County Historical Society and Museum in Union December 27, 2013. 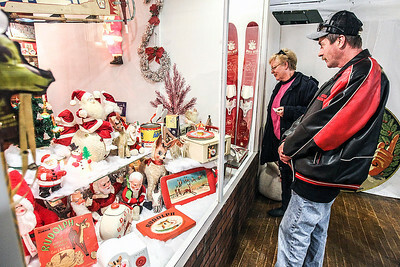 Society board member Dave Harms of Crystal Lake, with the help of antique dealer Lynne Eltrevoog of Marengo, compiled the must-see display featuring a selection of rare, vintage radios – including one honoring Mickey Mantle and Roger Maris, plus a working 1951 Rudolph the Red Nosed Reindeer model. 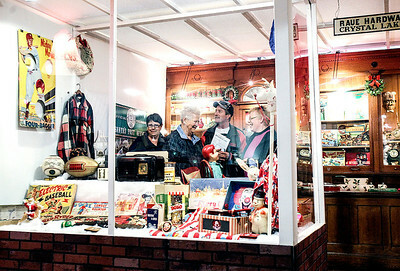 The display is meant to re-create the feel of a 1950s streetscape.